Since NHL (6) was born, I can probably count the number of movies that I have seen in the theater on one hand. The last was Twilight for a girls day out with a friend. We saw this quite a bit after the release. Prior to that, I think we saw a movie before JSL (2) was born with my brother and his wife. The one before that was NHL’s first time in a theater. We saw Happy Feet with lots of extended family over Christmas break while out of town. Although I like going to the movies, the cost is not worth it to me. I like being in the comfort of my own home, being able to stop the movie when I need to use the facilities and tossing the kids into bed if they fall asleep. We recently won a Roku Box and decided to get Netflix with it. Thanks to this we have movies on demand and can have a few DVDs at home. My problem: I can’t remember all of the movies that I wanted to see when they were in the theaters and are now on DVD. I should have made lists, but I never did. Right now I have Julie & Julia, along with Harry Potter and the Half-Blood Prince to watch. Cloudy With a Chance of Meatballs is next on our Queue and after that a bunch of things for TechyDad, the boys and some television shows. What movies have you seen lately that you would suggest we add to our Netflix queue? I have not seen any movies recently, sorry to be of no help. I need to bookmark this post! We just got the Roku (Netflix live on tv) and I struggle with this but always forget to ask! We just watched UP! last weekend and it was a REALLY good movie LOL! .-= Jennifer @ J. Leigh Designz´s last blog ..Aloha Friday – O Christmas Tree! =-. .-= Annie´s last blog ..Aloha Friday! Global Warming =-. Oh my….we never get out to see movies either! I have a gazillion “girl” movies I want to see including Confessions of a Shopaholic….I read ALL the books (which are probably better, but still)! Oh, and my hubby wants us to watch Four Christmas’s together, even though it’s after Christmas! Happy Friday and here’s my Aloha!! 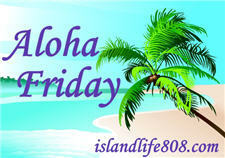 .-= Niky @ Design It Chic´s last blog ..Aloha Friday!! – What’s your plan, duck?!? =-. Well, we just watched the new Harry Potter and Night at the Museum….both good. Harry of course was better than good. lol. We also saw the Proposal with Sandra Bullock and it was real good. .-= sheila´s last blog ..Aloha Friday ~ 1040 =-. The last movie I saw was Up and it was great. .-= Annie´s last blog ..Aloha Friday!!!!!!!!!!!!!!! =-. My husband and I watched the hangover the other day. It is not a family friendly movie-but it is pretty funny. Hilarious! Twilight was the last movie that I saw too. Check out Blind Side. I loved that one! .-= Pamela M. Kramer @ A Renaissance Woman´s last blog ..Freebie Friday – Week 41 =-. If it’s not on cable I probably won’t see it. I really don’t have any good ideas at the moment. .-= Harriet´s last blog ..Did you get a ton of snow? =-. .-= Auntie E´s last blog ..Aloha Friday -A Remedy Needed? =-. That is awesome that you have a Roku! I’m not a theatre buff either because the expense isn’t worth it and I’d rather be able to stop my movie and get dessert or put kids to bed too :) So we do netlix also. I haven’t watched any new movies lately so I have no idea what to suggest. Have you seen the Princess and the frog? .-= JamericanSpice´s last blog ..Aloha Friday: Smoothies =-. We do get to the movies on occasion but not often. We’re going to see Avatar tomorrow, thanks to Parents Night Out. We’ve been members of Netflix for several years and we love it. We have multiple queues – one for adult movies, one for kids movies and one for TV shows. We have the 4 at a time plan, which I don’t think is available anymore. .-= Nancy T.´s last blog ..Things I learned this week =-. Julie/Julia.We both loved it and blindside!!!! .-= Olga´s last blog ..AloHa FriDaY!!!! =-. 2012 was great! not for kids although teens and up are ok. Blind Side is a great flick! It’s funny because I rarely get to see a movie in the theater, too. I have a 36 hour layover coming up and I’m so excited that there’s a movie theater in walking distance. I want to see Blind Side. .-= kailani´s last blog ..Project 365: Day 8 =-. I saw the Thomas the Train movie. The Hangover! It’s absolutely hilarious!